Breakups are hard, but they shouldn’t have to be. With Liquid Web, switching hosting providers is seamless and easy. If you’re in a bad hosting relationship, it won’t be long before you realize the ugly truth: it has to end. But what do you do then? Despite all the problems (your website’s significant downtime, that rude customer support technician, your inability to upgrade your account … the list goes on), the idea of finding someone new, migrating all your data, and dealing with the hiccups associated with a new relationship may sound like more trouble than it’s worth. Not with Liquid Web! There are many factors you might worry about once you’ve decided to make the switch. For one, you might not be aware of what kind of technical requirements your website needs to run. You may not even fully understand what it means to migrate your website’s data to a new hosting provider. With Liquid Web’s™ Heroic Support® team, we will be there every step of the way and will help you find answers to all your questions. Whether you have technological savvy or need someone to walk you through every step, our on-site team is available 24/7/365 to help you make the switch. Our migration processes are guaranteed to make your switch feel effortless. ♦ Free Migrations** – Depending on your technical environment, Liquid Web™ offers free migrations. We will move all of your data, including website files, databases, and email accounts, to their new home on Liquid Web’s™ servers. ♦ Lowering Your TTLs – Before the migration takes place, we will lower your TTLs (Total Time to Live) to decrease the length of time it takes to update your DNS information. Quickly updating your DNS information will mitigate the number of customers that will have issues with your website during the transition. ♦ Free Month of Service* – We understand how expenses can add up during a move like this, so our flexible plans can also offer a free month* of service while you finish your contract with your old hosting provider. At the end of the day, you shouldn’t have to put up with poor service or an unreliable connection. 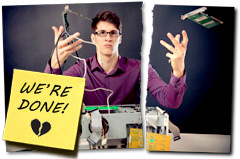 Let Liquid Web help kick your current hosting provider to the curb! Supported around the clock by our Heroic Support® team, you can rest assured that this new relationship is going to last. Contact us today to get started! Call 1-800-580-4985 one of our support technicians. **Certain restrictions apply, ask a sales specialist for details.